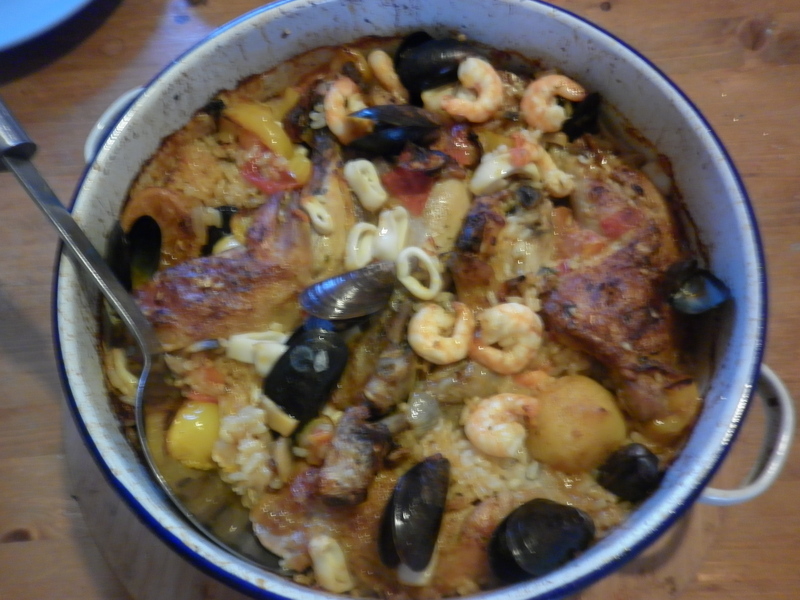 Okay so no-one from spain would probably recognise this but Zeph is crazily pleased with his take on paella. Actually, so am I since he managed most of it himself and it was really tasty. The only thing we bought specially was the mixed seafood pack as the rest was hanging around in the freezer and cupboards. Another reason it wasn’t exactly authentic. The funniest thing was the speed him and Ida disposed of the mussels. They were either side of me at the table and it was like dining between a pair of ravenous sea otters. Ida can be as picky as any other toddler. I read somewhere that it’s a survival instinct to stick to what you know while foraging and that you have to serve a new food item fifty times before they’ll accept it. On the whole though they’re a pleasure to cook for and eat with. Zeph will usually give anything new a try and gets genuinely excited at the idea of cooking something. Now if I could just get Zeph as interested in washing up as Ida is. This entry was posted in Uncategorized and tagged Beautiful Things, children, cooking, crazy mum, food, parenting. Bookmark the permalink. hmm….. maybe the boys can get together and order junk food!! ha! he’d be there in a flash! I need to involve them in cooking more again. Rosemary used to join in quite often, but I avoid it these days, because it’s easier if she plays with Eleanor while I cook. So true – it is aways quicker without the help 🙂 I had a real glimmer of hope with this cooking though as at 8yrs old Zeph really did most of the actual cooking with intructions from me over my shoulder as I washed up and did other stuff. Ida was being distracted by Steve – I suspect things would have been very different with her help.